Display ads for your company, product, program or service appear in ACSA's informative weekly newspaper. Display ads for your company appear in ACSA's award-winning magazine, published five times a year. Advertise an open position in EdCal's CareerConnect section and ACSA's online Career Center. ACSA's publications offer opportunities to advertise your business, programs, services and products, as well as open employment positions. Learn how ACSA can help you reach an audience of school administrators throughout California. Make your advertising dollars count! Display ads in EdCal are an affordable and effective way to promote your business. Products, programs and services advertised include degree programs, school improvement methods, events, software, publications and more. These ads run in the main section of EdCal, ACSA's weekly newspaper, and reach school administrators making millions of dollars in purchasing decisions every year. For complete information on display ad size, deadlines, placement, artwork specifications, payment options and publication dates, please see the rate card and calendar below. We offer the back cover of EdCal for maximum exposure of your product, program or service. See the rate card for details. We also offer the opportunity to include an insert. Read the pricing and policies. For more information about display advertising in EdCal, or to place an ad, please contact the display ad coordinator, Emily Agpoon, at 916.329.3833. 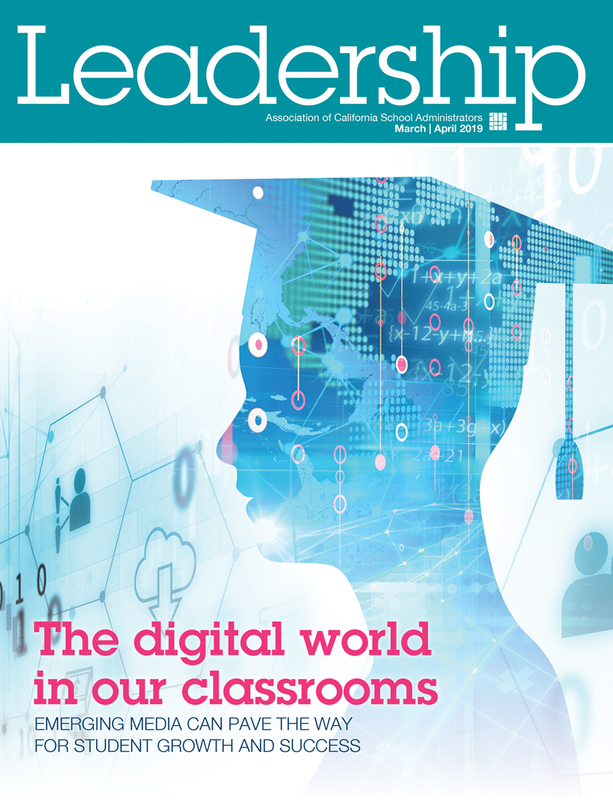 Leadership Magazine provides in-depth information about the most critical issues facing school leaders today. The award-winning magazine is sent to 17,000 ACSA members, as well as other decision-makers who subscribe. Our surveys show that readers pass along their issues of the magazine to at least two other colleagues, making our readership more than 55,000 educators. The magazine is published five times a year, and each issue has a specific focus. Articles are written by education practitioners and other experts. Take advantage of this opportunity to reach school leaders through one of the most respected publications they read. For more information about advertising in Leadership, contact sales rep Diana Granger at granger(at)cwo.com or 530.642.0111. More than 17,000 ACSA members receive EdCal and Leadership magazine throughout California. In addition, surveys have reported a pass-along readership of more than 55,000 educators, including district and county office and school site staff. The school leaders who rely on our publications for information to get their jobs done are the people who hold the purse strings, making decisions to purchase products required for the operation of school systems and seeking out the most current, effective solutions for K-12 education. 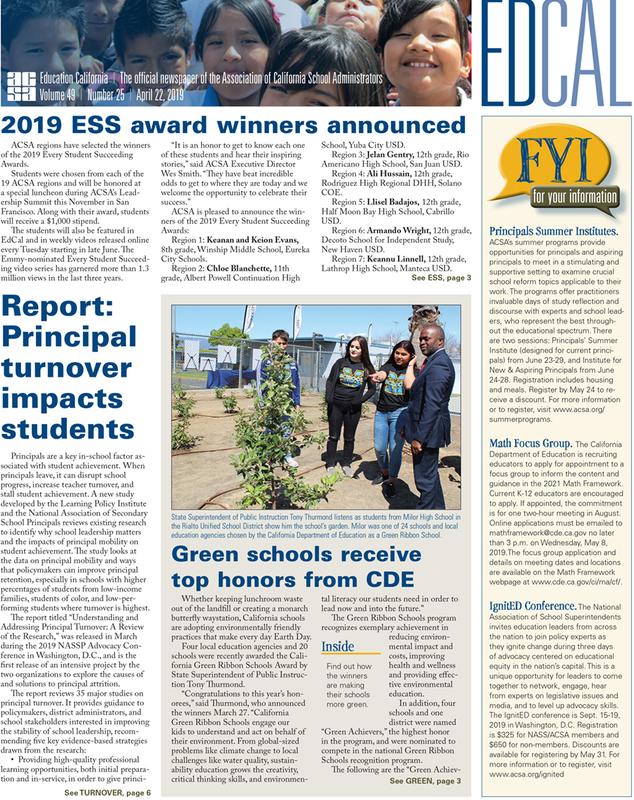 Though primarily recognized as printed publications, EdCal and Leadership are also available in digital format, receiving as many as 600 views a week.